I believed, and I know our team believed, we were a team of destiny. You don’t make a third-and-16 play, you don’t come back from an eight-point deficit to miss on a kick. It was December 3, 2005. The temperature varied from -1 degree Celsius to -6 degrees — an unusually cold, brisk day. Buses were lined up ready to take fans — students, faculty, staff, parents and locals alike — on a 55-minute ride to the nearby city of Hamilton to cheer on the Wilfrid Laurier Golden Hawks men’s football team. 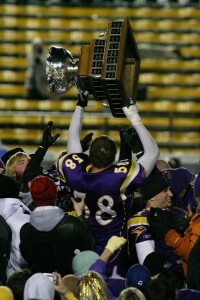 It was the day of the 2005 Vanier Cup final between the Golden Hawks and the Saskatchewan Huskies. To head coach Gary Jeffries, the culmination didn’t start a few hours, or even a few days before that Vanier Cup matchup. It started in 2003, when he was officially hired as the head coach and manager of football operations. Laurier had a 1-7 record in 2002 before Jeffries found himself as bench boss. “I think we went from 1-7 in ’02 to 6-2 in ’03 and went down to Queen’s and had one of the biggest upsets in the [Ontario University Athletics] playoffs and getting to the Yates Cup down [at McMaster],” he recalled. 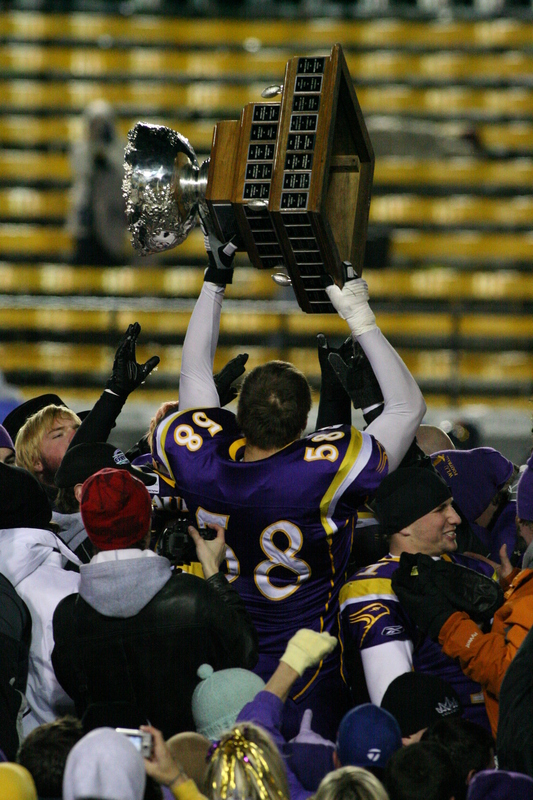 Laurier couldn’t complete the upset in 2003, but remembered the feeling of getting close. The team was building itself from broken pieces to one unit. “They all came together and they created this ‘one team’ policy that they rallied around. Everything they did, off the field, on the field, they made each other accountable,” said athletic director Peter Baxter. “Our philosophy was a ‘one team’ philosophy that there was no one person bigger than each other. We did it for each other and I think that was imperative. It’s amazing the success you can have when you don’t care who gets the credit,” Jeffries explained. The adversity continued. 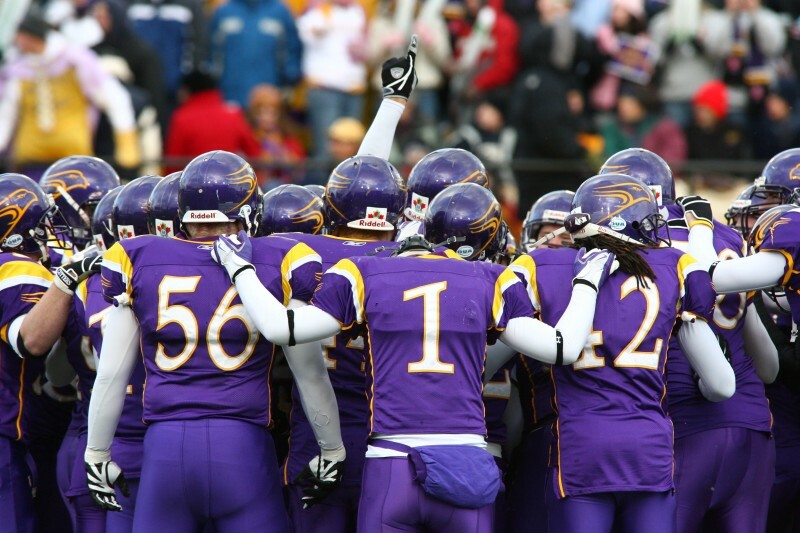 In 2004, Laurier went 8-0 in the regular season and defeated a highly-touted McMaster team before heading to the Uteck Bowl to face the Laval Rouge et Or. But that’s as far as they would get. A 30-11 loss sent Laurier back to the beginning again. “After that, the guys said, ‘We know now what the level is, and we’ve got to get back to it,’” Baxter said. The 2005 season culminated with an 8-0 campaign before the Hawks and a small contingent of fans headed to Nova Scotia, easily handling the Acadia Axemen 31-10. The 14-year drought was over, and Laurier was headed to the Vanier Cup. Receiver Andy Baechler remembers it clearly. There was no Twitter, no Facebook and certainly not the same networking abilities there are today. The team was in the Concourse, handing out flyers and talking to students, selling tickets to the most important game of their lives. “As a group, we were fairly calm, but the excitement around campus was pretty tangible,” Baechler said. The community was behind the Hawks. Tickets were selling fast right out of the athletic office and students were finding every way to get to Hamilton for the biggest game since 1991. “As players on that team, we felt the support from students and it was one of the best parts of the experience,” then-kicker Brian Devlin recalled. The Laurier support made the game in Hamilton feel like a home game. The majority of the 17,000-person crowd would be dressed in purple and gold. The buses were crowded and an Irish pub in Kitchener-Waterloo was hosting alumni to watch the game. “It’s hard to describe the buzz around campus. Everybody wanted to be at that football game,” Baxter said. It wasn’t looking good. The Saskatchewan Huskies were one of the best teams in the country. On paper, and in person, they were bigger, faster, stronger. Everyone predicted Laurier couldn’t hold their own — they were going to be destroyed. But Jeffries shrugged it all off. Every interview request was asking the same questions: How will you handle the Huskies? Are you anticipating a blowout? What’s the game plan coming in as underdogs? But the battle-tested, straight-focused Hawks were looking nowhere but the prize. Pyear recalls the mentality of the team being “inward-focused” — worrying about the next play and not much beyond that. When the Hawks got to the hotel in Hamilton, Jeffries remembers seeing the quarterback of the Huskies team and the size of every one of their players. Game time was nearing on that cold day. The locker room at Ivor Wynne Stadium is when the majority of players began to focus. Everybody was in their own headspace. The locker room had two different sections to it — one part for the offensive players and one for the defensive players. Players were slowly gathering in one part for Jeffries to give his final pre-game speech of the season. But beforehand, Pyear began wandering around the locker room, trying to find his own space to zone into the game in front of him. He wanted to gather his own thoughts before evidently the biggest game of his university career. First, he went into a washroom stall, but one of the offensive lineman was already there. He was in full gear, helmet on, rocking back and forth. Pyear went to the next room. Joel Wright, a receiver and defensive back was pacing. Aside from the music, there was no sound. From there on, it was game time. “When we came out of the tunnel before the game, to see the school colours up in the stands was pretty impressive,” said then-kicker Brian Devlin. And as the game began, the confidence grew. The first few plays of Saskatchewan’s were crucial for Laurier. A couple stops and the confidence built. By halftime, the Hawks led 8-7. “We were certain by that point that we could play with them, and that we could win this thing,” Jeffries said. But Saskatchewan came back stronger, scoring two touchdowns and adding a field goal to go up 23-15 halfway through the fourth quarter. It seemed almost out of reach as less than three minutes was etched into the scoreboard. 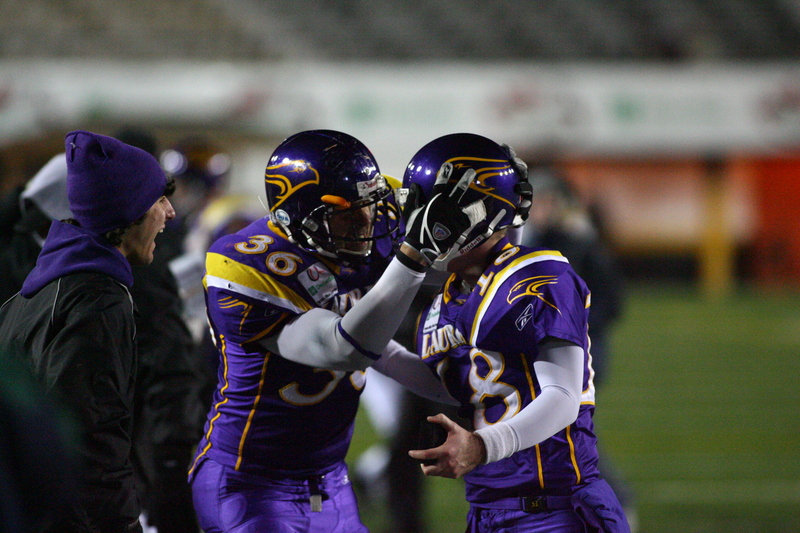 Pyear connected with Bryon Hickey for a touchdown and a failed conversion brought Laurier within two points with just under three minutes to go. The defence achieved another two-and-out, forcing Saskatchewan to turn the ball over. It all came down to the final 1:45. Jeffries and the team may replay the final minute and 45 seconds in their minds forever. After a few stops, Laurier was against the wall. It was third down with 16 yards to go. Jeffries decided to call a time out. Offensive coordinator Stefan Ptaszek had a play — the play that could get them the yardage, just enough to put Devlin in position for a field goal. So they decided to go for it. Pyear walked into the huddle to a sense of calm amongst the players. It was the biggest play of their lives, but they were ready. The ball was going to Baechler. But as the ball was snapped, Saskatchewan’s defensive end was coming off the edge pretty quick and Pyear was in trouble. Receiver Dante Luciani was heading up field, and Pyear, scrambling, knew where he was going. Luciani caught the ball and Laurier was in field goal territory. They had one more chance to win the football game. It all came down to Devlin’s kick. With a near-perfect season, Devlin could make a 32-yard field goal in his sleep. The length was nothing to him. But the pressure was palpable and he had missed a kick earlier in the evening. “It was a situation in the game when Dante made that catch on third-and-16 and once we got that first down I realized ‘well, I better get warming my leg up,’” Devlin said. He lined up for the kick. Silence filled the air. Baxter was holding his breath. Jeffries could barely watch. The entire Golden Hawk cohort on the sidelines was holding hands, just as they did for every big play. “The rest of it, I couldn’t really tell you too much until I hit the ball and saw it going in. I remember from realizing that it was going to come down to a field goal to when I knew the field goal was going in,” Devlin said. The kick was good and Laurier led 24-23 with 19 seconds left on the clock. “I believed, and I know our team believed, we were a team of destiny. You don’t make a third-and-16 play, you don’t come back from an eight-point deficit to miss on a kick,” Pyear said. Pandemonium ensued, but the defence needed one more stop. Jeffries collected his team and the defence went to work. Two consecutive stops meant Laurier was one incompletion away from the title. And with zeroes on the clock and an incomplete pass, Laurier found victory. The bus ride back was another blur — a blur of celebration, comradery and excitement. The team made it back to Laurier as the community filled the Athletic Centre gym for a pre-planned, licensed celebration. Pyear carried the trophy through the crowds of people with Ian Logan as the place erupted in cheers and tears of joy. “We’re such a small school, a very close-knit school so I think you get a lot of pride and a lot of passion towards our sports teams. And when you’re winning a championship of that magnitude, everyone rallies around it,” Devlin said. “As players on that team, we felt the support from students and it was one of the best parts of the experience,” Baechler echoed. David McMurray, at the time the dean of students for Laurier, remembers vividly celebrating in the gym. To him, the team and the school grew together over four years. 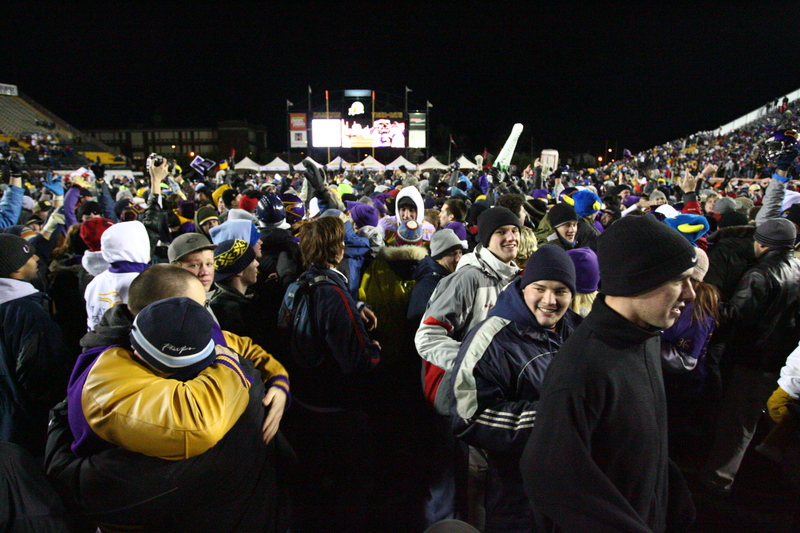 Everyone agreed the win ‘put Laurier on the map.’ As a school of merely 10,000 [students], the pride and passion that the members of that 2005 team remember from the Laurier community was something that made them recognizable. Admissions soared after that year. Sponsorship increased. The reputation changed. On September 25, 2015, the team met once again as they were forever etched into Laurier’s Hall of Fame. Devlin talked about his five-month old son while Baechler, just recently hired by the University of Guelph, spoke highly of his four-person family. McMurray wore his Vanier Cup ring that the 2005 team got him, sporting “Dean” on the side. Pyear, now a marketing and undergraduate recruitment specialist, rushed back from the Ontario Universities Fair at the Metro Toronto Convention Centre to Waterloo for the ceremony and some downtime with his former teammates. And Jeffries, who was absent from the Hall of Fame induction ceremony, sits back in his Southampton, Ont., home, taking in more than his share of golf games. But regardless where the contingent ends up, one thing remains the same. “For me, it’s without question the greatest sport moment of my entire life. It’s something I’ll have forever, I’ll cherish forever,” Jeffries said.